Tool specialist KS Tools have a new bleeding set for diesel engines in their product range which is suitable for a great many different vehicles. 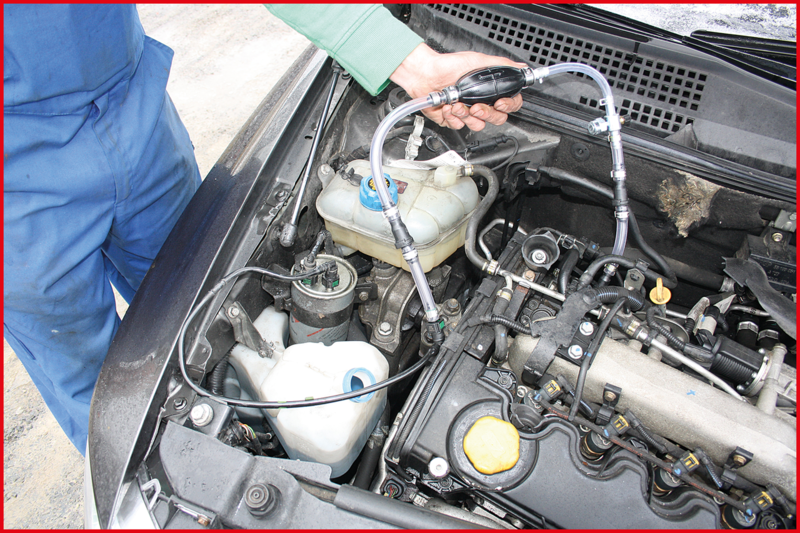 With the help of this tool, professional mechanics can maintain those vehicles with ease whose fuel system is not self-bleeding and which are not fitted with a hand pump for bleeding. For when there is air in the system, the engine will only start with difficulty or not at all. On top of that, the absence of lubrication from the diesel leads to expensive damage to the highly sensitive fuel system pump elements. The tool comes with different quick-connectors enabling fast setup times and is therefore ideal for independent workshops. The seven-piece diesel bleeding and priming set is obtainable from KS Tools under the product number 150.9030. Modern diesel engines have to build up a fuel pressure of up to 2000+ bar in order to run efficiently. Any air in the fuel supply system will compromise the running of the engine as sufficient pressure cannot be built up within the system. If the system is opened in the course of maintenance work, air will inevitably enter it. If this air is not removed from the system after the work is completed then this will lead to starting problems and the absence of lubrication from the diesel can lead to harshly expensive damage to the pump elements in the high pressure circuit. 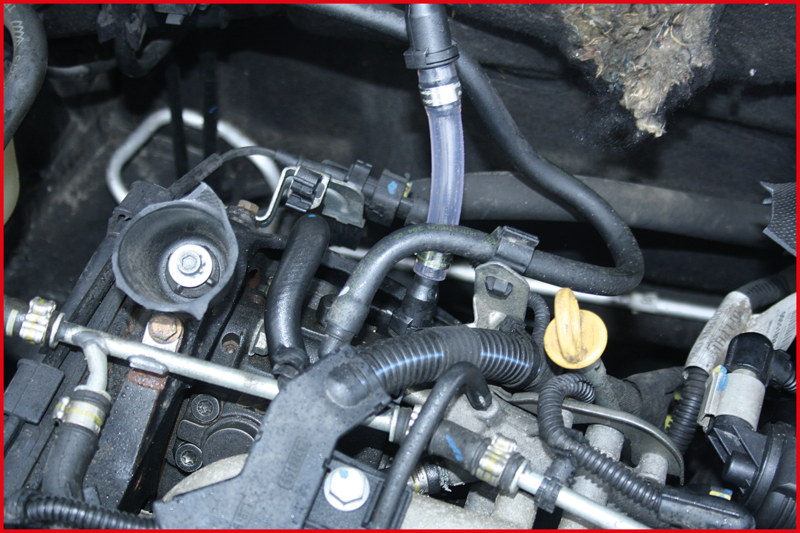 Even where many modern systems are either self bleeding or have a fixed hand pump fitted to the vehicle, all other vehicles must also be bled. The bleeding set from KS Tools can be coupled to very different vehicles with its quick-connectors. It is connected to the low pressure side of the fuel system. It is not only used when changing the delivery pump or the fuel filter but also when replacing high pressure pumps or other system components. Bleeding the low pressure side prevents, among other things, defects to the high pressure pump which can occur during filter change without manual bleeding, for example. Diesel fuel provides the sole lubrication within the system. That is why it is particularly important that it never runs dry. Apart from that, due to this bleeding, the car can be started after the repair without problems. But the tool is not just for safe bleeding of the fuel system. It can likewise be used to good effect where there are leaks in the low pressure system. It assists in locating the causes of a potential pressure loss. This is possible via the Schrader valve in the area of the bleed unit. The mechanic can connect a conventional vacuum gauge or a low pressure fuel indicator to this point and thus test the delivery pressure of a low pressure pump from the tank or the vacuum of a motor driven suction pump to the high pressure pump. 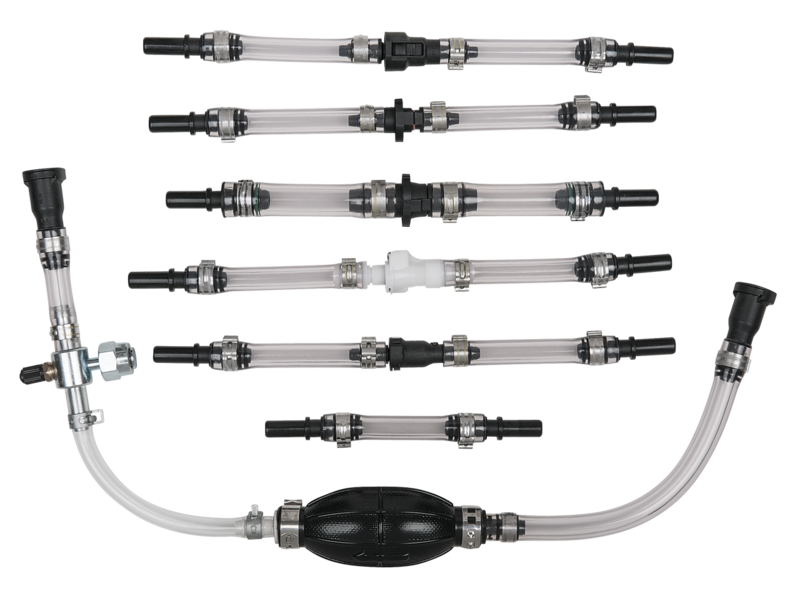 The set from KS Tools contains six different adapter hoses with original plug connectors from the manufacturer and a hand pump with bleed unit. All of the adapter hoses are fitted with a 10 millimetre plastic pipe so that a connection to the bleed pump can be made. The seven-piece diesel bleeding and priming set is suitable for vehicles manufactured by Ford, PSA, Opel, GM, Fiat, Rover, Land Rover, Renault and Mercedes-Benz. The set is supplied in a clearly arranged hard foam tool inlay. The high quality design guarantees a long service life in daily workshop use.